Microsoft has revealed the games they’ll be adding to Xbox Game Pass in February, and it’s looking like a packed month! 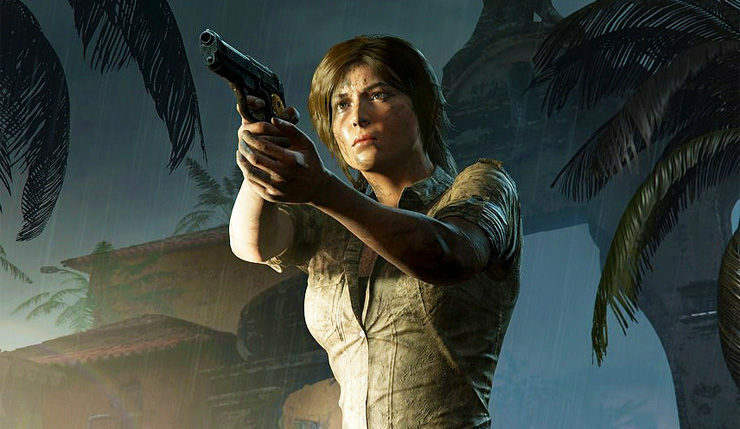 In addition to Crackdown 3, which hits the service at launch, Microsoft is also serving up Shadow of the Tomb Raider, Batman: Return to Arkham, The Walking Dead: The First Season, and more. Plenty to keep your thumbs warm on those cold February nights! Play as Lee Everett, a man with a criminal past given a chance at redemption — protecting a young girl named Clementine during a zombie apocalypse. Explore stunning comic book style environments, solve puzzles, fight the undead, build relationships, and do whatever you can to keep your humanity in a world gone to hell. Every choice is on the clock, every mistake will be your own, and the consequences carry across the entire five episode series. Jump on the pedals and hit the ramps in this momentum-based trickathon. Pumped BMX Pro features more levels than ever, each with their own set of challenges for you to smash. Choose one of the pre-designed bikes; or ride to the editor to create your own custom bike before smashing the global leaderboards and your friends scores. Become a master of color in the 3D platformer de Blob. Equal parts amorphous blob of paint, struggling artist, revolutionary, and juvenile delinquent, de Blob’s goal is to replace the drab, lifeless gray coloring that the I.N.K.T. Corporation has imposed on Chroma City and its inhabitants. Flip, bounce, and smash your way past a diabolical array of hot plates, electric shocks, and ink turrets. Compete to control Chroma City solo or with up to four players via split-screen across eight unique and challenging multiplayer modes. Batman: Arkham Asylum and Batman: Arkham City collects the first two games in the iconic Batman Arkham series. Batman: Arkham Asylum, journey into the depths of Gotham City’s high security psychiatric hospital and battle supervillain inmates who have taken over the Asylum. Then go soaring into Arkham City, a super-prison built to contain Gotham’s worst criminals in Batman: Arkham City, one of the most critically-acclaimed games of all time. A throwback with all the ingredients that made the series a fan favorite. Over-the-top and crazy antics will have you stopping crime as a super-powered agent of justice in a comic book inspired playground of mayhem and destruction, either solo or co-op with a friend via Xbox Live. Then hop online and get in on in the Wrecking Zone, where unprecedented destruction meets amped-up action. Level the entire battlefield with fully-destructible arenas, take out competitors by bringing down bridges, and soar through the air with a series of jet jumps and flying fists. Xbox Game Pass grants players access to more than 100 Xbox One and Xbox 360 games for 10 bucks a month — you can check out a full list of available games here. Interested in Game Pass, but don’t have an Xbox One? Microsoft recently launched the Xbox All Access program, which gets you an Xbox One console, Xbox Live, and Game Pass for a reasonable monthly fee – you can get more details here. Also, for a limited time, new subscribers can get their first month of Game Pass for only $1. What Xbox Game Pass titles will you be tackling next month? 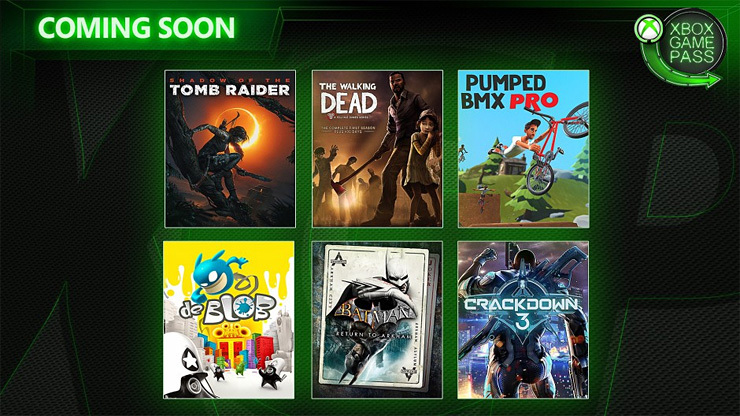 Everybody’s probably going to try out Crackdown 3, but you shouldn’t miss out on Shadow of the Tomb Raider, The Walking Dead, Batman, or De Blob, either!